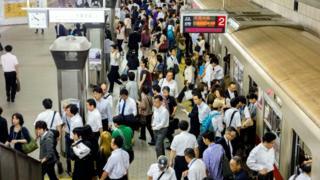 Members of the public noticed the odd names and posted photos on social media, causing the Japanese hashtags for "Sakai Muscle" and "Osaka Metro" to trend. As well as English, the website had been translated into Chinese, Korean and Thai. It's not known whether those sites contained errors as well, but they have all been taken down as a precaution. The metro did not say when the pages would be back online. For now, visitors to the English language page are automatically redirected to the main Japanese site. Meanwhile, Microsoft told the BBC that it would "take appropriate steps to support our customer". Osaka's metro is hardly alone - in fact, errors translating between Japanese and English are pretty common. Earlier this year the singer Ariana Grande tried to get a Japanese tattoo on her wrist saying "seven rings", the name of her latest single. When she posted a photo online, fans pointed out that it actually said "barbecue grill".